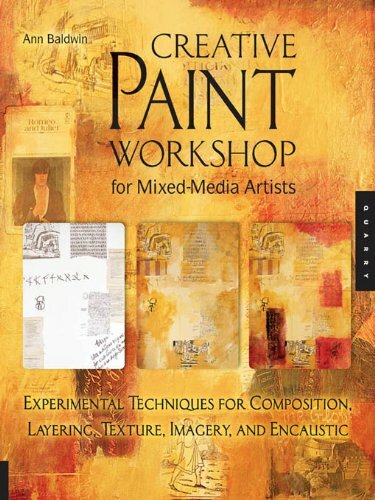 Whether you have formal training in painting or no experience at all, this workshop-style book is the perfect guide for any artist interested in integrating the medium of paint into other types of artwork such as surface design, mixed media, collage, altered art, or art journaling. Creative Paint Workshop for Mixed-Media Artists explores a wide variety of innovative and experimental paint techniques that can add stunning visual impact and texture to many types of work. —Develop your sense of composition and learn new approaches to abstract design. —Experiment with texture effects, collage, inclusions, and encaustic. —Learn how to use the latest new products to achieve magical effects. —See how to use digital imagery, including how to do transfers with wax. —Be inspired by the work of a wide variety of cutting edge, mixed-media artists and experimental painters.